Welcome to another wonderful color challenge from the CR84FN Challenge Blog! Thanks so much to those of you who played along with us for the last challenge, it's always wonderful to see how everyone uses the color challenges! 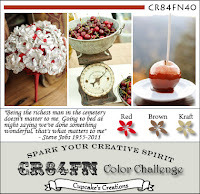 The next two week color challenge is Red, Kraft and Brown, we also have Cheryl Lea joining us as our Guest Designer. Inspired by the colors, I used the wonderful Santa image from the Artistic Outpost Snow Woods plate and some MME papers. The ornaments are part of the MME papers and worked wonderfully with the placement of the old time Santa image. The image is stamped in Ranger Coffee Archival on Kraft card stock, all edges are distressed with the Prima Distressing Tool and sponged with Gathered Twigs Distress Ink. The sentiment was stamped in Cherry Cobbler on a scrap of MME paper. To embellish I added some Champagne Tulle, a Rustic Star, and a bit of Spica Glitter Pens to the ornaments. Here's this weeks color inspiration, we'd love for you to play along with us at CR84FN, you can find all the details here on how to enter. If you upload to any online gallery please use keyword CR84FN40 so we can find your creations! What a Vintage beauty Lisa! I'm lovin' the Old Time Santa image and the pretty gold bow! Your card sure puts me in the Christmas spirit! Love the vintage santa image, and that bow is magnificent! A gorgeous Christmas card! 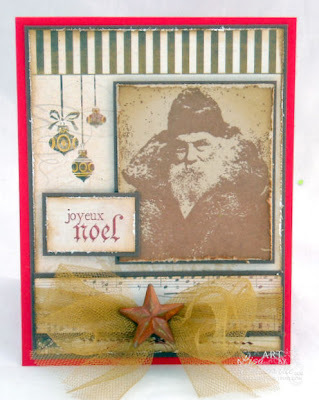 A fabulous vintage look to your card - I do like the image of Santa. Lovely bow and ornaments - just so festive! What a beautiful card! Great mix of papers and textures. I love that Santa stamp, and I'd never have thought to stamp it on kraft cs, but it really gives it an authentic aged look. Artistic Outpost is new to me, but I'm definitely going to pay them a visit! My favorite Christmas set and your card design really shows him off. Beautiful card. Love that bow with that metal star! I love vintage Santas and you did a fabulous job on this card!!!! Way to go!!!!! This vintage Santa looks fabulous on this card. Great idea and really beautiful card! Lisa, LOVE the vintage Santa and all of the distressing that added to the rustic look! The tulle and star are FAB details and really make this card special! Wonderful classy vintage Christmas card Lisa! Love the composition. :-) Thanks so much for sharing this with us this week at The Kraft Journal! Beautiful, Lisa! Love the wonderful vintage Santa! fabulous card with these colors, hoping to play this week! Gorgeous vintage Santa! Amazing card Lisa - I love that Star embellie!!! A lovely vintage style card. Simply stunning, love all about it! Happy to se that you have joined the challenge this month at Floweret challenge blog! Love the vintage Santa and your card. Great job on the challenge! I love these colors together. Lisa, this is so lovely. Thanks for joining us at Little Claire's.